Sandals is found a mere hour's drive from Port Elizabeth and he Eastern Cape game reserves, in the pretty coastal town St Francis Bay. Sandals is found a mere hour's drive from Port Elizabeth and he Eastern Cape game reserves, in the pretty coastal town St Francis Bay. 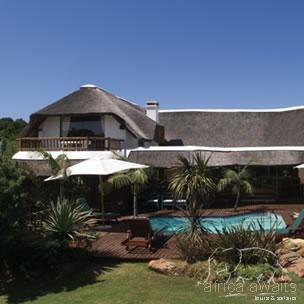 A thatched lodge, decorated in an Afro-Caribbean style, is set amongst lush indigenous milkwood trees. The palm fringed pool, fully licensed pool bar and craggy rocks create a wonderfully relaxed atmosphere. 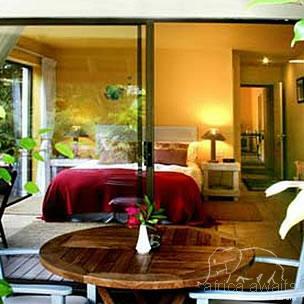 Spacious bedrooms have baths, showers, extra length beds, private decks or patios and all modern comforts. Only metres from the main beach and within walking distance of quaint village shops, golf course, restaurants, tennis and squash courts. 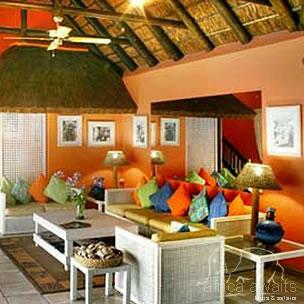 With your holiday, safari or business trip from in to Sandals Guest House in Eastern Cape.